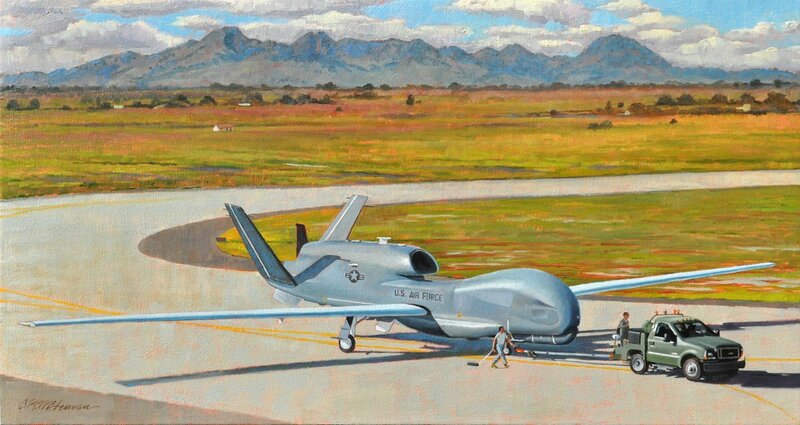 The RQ-4 "Global Hawk" is an unarmed, unmanned, remotely controlled, high-altitude, long endurance reconnaissance aircraft that can reach anywhere in the world within 24 hours. 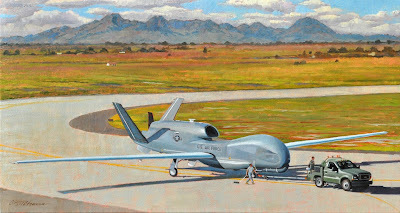 In addition to it's role in military surveillance, the Global Hawk is used to gather information in situations such as the Haitian earthquake and California wildfires. But I rather liked the wood lettering on the conference room ceiling at Beale: "In God we trust; all others we monitor." In even-numbered years, civilian artists who donate paintings are flown to a formal dedication banquet attended by the Secretary of the Air Force and other dignitaries. Past events have been at Andrews or Bolling AF bases in Washington, DC. This year's event will be held at the Air Force Museum in Dayton, OH, where we will have a behind-the-scenes tour. I donated another painting four years ago; but, after making all the arrangements, we were unable to attend because my son was too ill; so this will be my first banquet. The painting looks great. The reward you get for the donation is nice, too. Have fun!